Updated at 9 a.m. EDT (1300 GMT) Sept. 8 after successful launch. India’s Geosynchronous Satellite Launch Vehicle blasted off Thursday with a meteorological observatory destined to track storms and tropical cyclones from a perch more than 22,000 miles above Earth. 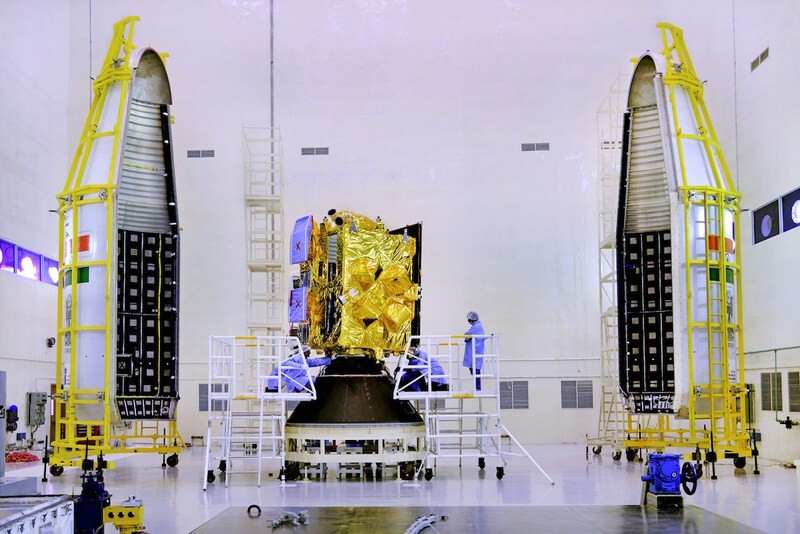 The Insat 3DR spacecraft mounted aboard the GSLV carries color and infrared cameras to image storms day and night, and a sounder to collect temperature, humidity and ozone data in different layers of the atmosphere. The satellite will also relay observations from remote weather station and ocean buoys to forecast centers, and monitor for distress signals from ships, airplanes and others in need of rescue. The GLSV Mk. 2 launcher lifted off at 1120 GMT (7:20 a.m. EDT) Thursday from the Second Launch Pad at the Satish Dhawan Space Center on India’s east coast, pitched on a trajectory over the Bay of Bengal and accelerated into an equator-hugging orbit with Insat 3DR. Launch occurred at 4:50 p.m. India Standard Time, 40 minutes later than originally planned after the countdown ran into delays. The 161-foot-tall (49-meter) rocket lit its four hydrazine-fueled Vikas strap-on engines at T-minus 4.8 seconds, then fired a core solid rocket motor as the countdown clock hits zero. The liquid-fueled booster engines and first stage generated up to 1.7 million pounds of thrust in the first two-and-a-half minutes of the flight, then separated simultaneously as the GSLV’s second stage engine ignited at a velocity of more than 5,300 mph (2.4 kilometers per second). Engineers stationed at a control center near the launch site reported the GSLV’s metallic nose fairing jettisoned on time about four minutes after liftoff. 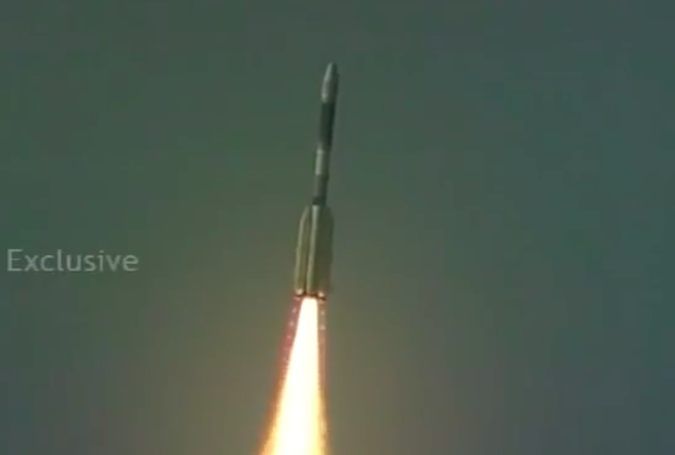 The Vikas engine on GSLV’s second stage fired until about T+plus 4 minutes, 49 seconds. Then the rocket’s third stage engine, consuming a mix of cryogenic liquid hydrogen and liquid oxygen, ignited moments later and produced more than 16,000 pounds of thrust for nearly 12 minutes, driving the launcher into orbit. Thursday’s launch, known as GSLV-F05 by India’s space agency, marked the fourth time in the GSLV’s 10 flights that the rocket launched with an Indian-made cryogenic upper stage engine. It replaced hydrogen-burning engines India purchased from Russia for the GSLV’s early test flights. The third stage powerplant switched off just shy of the mission’s 17-minute point in preparation for deployment of the 4,874-pound (2,211-kilogram) Insat 3DR spacecraft. 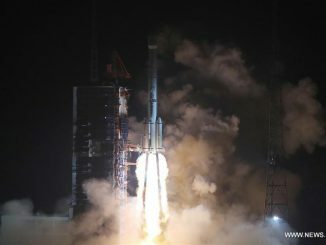 Officials said the rocket placed the Insat 3DR satellite into a “very accurate” geostationary transfer orbit, with a low point of 105 miles (170 kilometers) above Earth, just 1,000 feet (300 meters) from the preflight target. The GSLV aimed for an orbit with a high point of around 22,353 miles (35,975 kilometers, and the Insat 3DR satellite is within 50 miles (80 kilometers) of that altitude, according to K. Sivan, director of India’s Vikram Sarabhai Space Center, ISRO’s rocket development facility. The three-stage rocket is the more powerful of India’s two satellite launchers, but its history has been clouded by launch failures. India’s launch team completed Thursday the third successful GSLV flight in a row after a series of failed launches punctuated by back-to-back losses in 2010. GSLV flights resumed with smooth on-target launches in January 2014 and August 2015, which placed their satellite payloads into orbit “very accurately,” ISRO said. Overall, the GSLV’s official record now stands at 6-for-10, including earlier variants with Russian hardware. That compares unfavorably with India’s smaller Polar Satellite Launch Vehicle, which has logged 35 straight successful launches. The recent string of GSLV successes buoys hopes to launch India’s second robotic lunar mission — Chandrayaan 2 — in 2018 aboard a GSLV Mk.2 booster. Chandrayaan 2 will deliver an orbiter, lander and rover to the moon. Indian officials considered Thursday’s flight an operational launch, after the two last missions were deemed test flights. The Insat 3DR satellite extended its solar panels as planned shortly after its release from the GSLV upper stage, according to M. Annadurai, director of the ISRO satellite center. An on-board propulsion system will raise the craft’s orbit to geosynchronous altitude in the next few weeks, where Insat 3DR’s speed will match the rate of Earth’s rotation. The new satellite will settle into an operational position at 74 degrees east longitude. Insat 3DR’s imager can take pictures of cloud patterns and storm systems in six bands, ranging from visible to infrared wavelengths, allowing forecasters to track weather systems day and night, according to ISRO. The camera will collect an image every 26 minutes, and will “provide information on various parameters, namely outgoing long-wave radiation, quantitative precipitation estimation, sea surface temperature, snow cover, cloud motion, winds, etc.,” ISRO said in an information brochure released ahead of Insat 3DR’s launch. A sounder fixed on the Insat 3DR satellite will collect vertical profiles of atmospheric conditions every six hours over the Indian Ocean region, and every hour over selected parts of India itself, ISRO said. The spacecraft is designed for a 10-year lifetime. India’s next launch is scheduled from another pad at Sriharikota in late September, when a PSLV will fire into orbit with the country’s ScatSat 1 satellite designed to measure winds around the world, data that will help forecast track and predict tropical cyclones. The launch will also deliver to orbit three satellites for Algeria, and a pathfinder for a commercial high-resolution Earth observation satellite constellation planned by BlackSky, a company headquartered near Seattle. 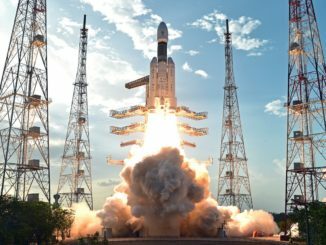 India plans the first orbital launch of the heavier-duty GSLV Mk.3 rocket, featuring two large solid rocket boosters, a dual-engine first stage, and a bigger cryogenic upper stage engine, as soon as December. It follows a suborbital test launch in 2014. 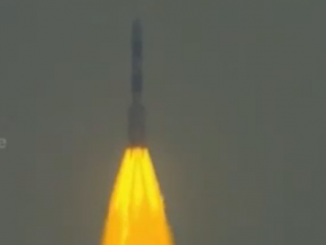 The GSLV Mk.3 will loft the GSAT 19E communications satellite on that mission. The next flight of the medium-class GSLV Mk.2 launcher is scheduled for March with the GSAT 9 communications satellite, officials said.